Dr. Agarwal graduated with honors from Kasturba Medical College in India. He completed his residency at the Postgraduate Institute of Medical Education and Research in India, where he also completed a nephrology fellowship. Dr. Agarwal was a nephrology fellow at the University of Minnesota Hospital and Clinic in Minneapolis. He then joined the Division of Nephrology, Hypertension, and Transplantation at the University of Florida in Gainesville as an assistant professor and was promoted to tenured associate professor. He was promoted to the rank of Professor at UAB in October 2005 and was named the Thomas E. Andreoli Professor of Nephrology in September 2006. He was appointed Division Director for Nephrology at UAB in January 2008 and Vice Chair for Research for the UAB Department of Medicine in October 2009. He was appointed to the Marie S. Ingalls Endowed Chair in Nephrology Leadership in April 2011 and served as Interim Chairman for the UAB Department of Medicine (August 1, 2011-August 31, 2012). Dr. Agarwal also served as the Interim Senior Vice President and Dean, UAB School of Medicine from Feb 2013-Oct 2013. 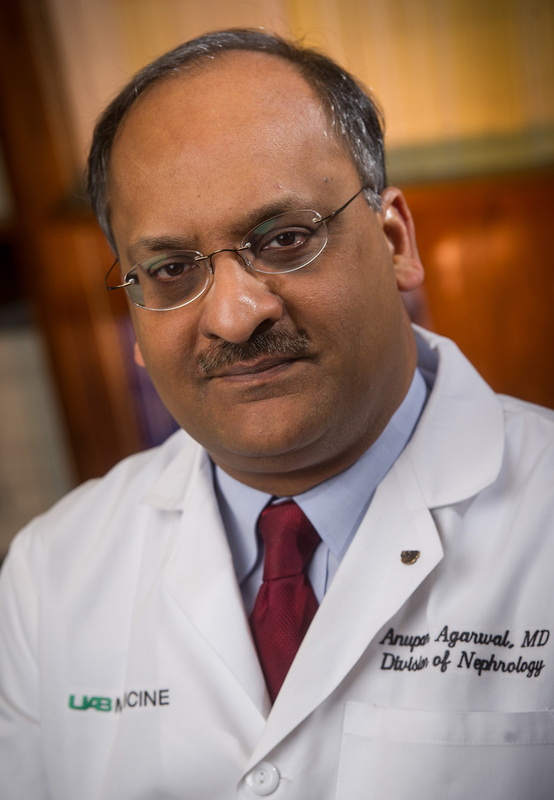 Dr. Agarwal's principal interests in clinical nephrology include acute renal failure, specifically in the intensive care unit setting, toxic nephropathies, fluid and electrolyte disorders, glomerular disorders, progression of renal disease, and diabetic nephropathy. His long term goals are to pursue a career in academic nephrology with the primary focus being on basic research, teaching and patient care. His goal is to apply knowledge gained from bench research to the bedside, enabling research to be a significant contributor to advancement in clinical medicine. Dr. Agarwal’s research efforts include three main areas. (i) His laboratory is studying the molecular regulation of the human heme oxygenase-1 (HO-1) gene in renal injury and in atherosclerosis. Induction of this gene occurs as an adaptive and beneficial response to injury and is protective in several clinically important conditions such as acute renal failure, transplant rejection, angiogenesis and atherosclerosis. Studies are focused on identifying regulatory regions in the human HO-1 gene that mediate induction in response to stimuli such as heme, cytokines, nitric oxide, modified lipids and growth factors (eg. transforming growth factor-beta). The studies involve molecular biology techniques to study DNA-protein interactions using chromatin structure analysis, in vivo footprinting, site-directed mutagenesis and gel shift assays. His laboratory is also studying the molecular and biological effects of nitrated lipids on HO-1 gene expression in endothelial cells and in the vasculature. (ii) The functional significance of HO-1 gene expression is also being evaluated using both in vitro and in vivo systems in transgenic animal models of acute renal injury, transplantation and atherosclerosis. (iii) His laboratory is actively pursuing gene delivery approaches in the kidney and the vasculature in animal models of transplantation using recombinant adeno-associated viral vectors. Alternate serotypes and capsid mutants of adeno-associated viral vectors are being developed to maximize gene transfer to the otherwise resistant vascular compartment in the kidney. Curtis LM, Chen S, Chen B, Agarwal A, Klug CA, Sanders PW.